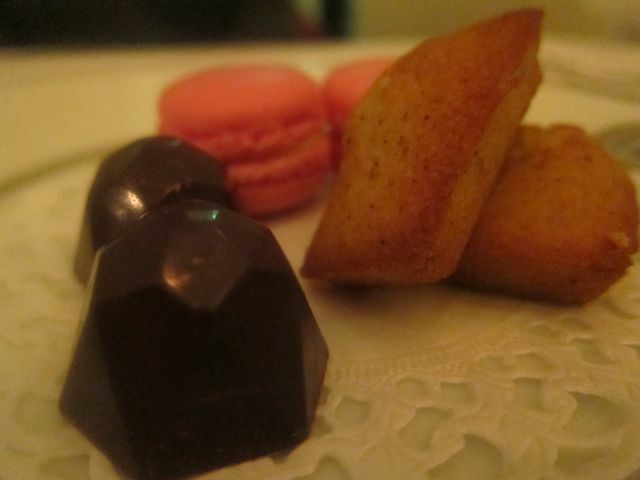 My mom surprised me with wonderful news when she had booked Stella Maris, 1 Michelin star restaurant, resting on rue Arsène Houssaye, a small side street, steps away from the Arc de Triomphe. Buried by other major restaurants, and covered with dark exterior decor, this restaurant might be even easy to miss. Chef Taturo Yoshino heads this venture and one might assume this is a Japanese restaurant, but Chef follows classical French cuisine by the book. The reception is a bit cramped as you walk in but you are immediately escorted to the main dining room of 7 tables (and 3 upstairs) very well lit and decorated in cream colors (from the walls to the plating). It was a Thursday night and a very quiet one indeed, with only 3 tables being served by the time we had finished dinner (after 10 pm). The two waiters at hand were very attentive but the dishes were much more pricier than 1 star Ze Kitchen Galerie, and perhaps less exciting in terms of taste and creativity? 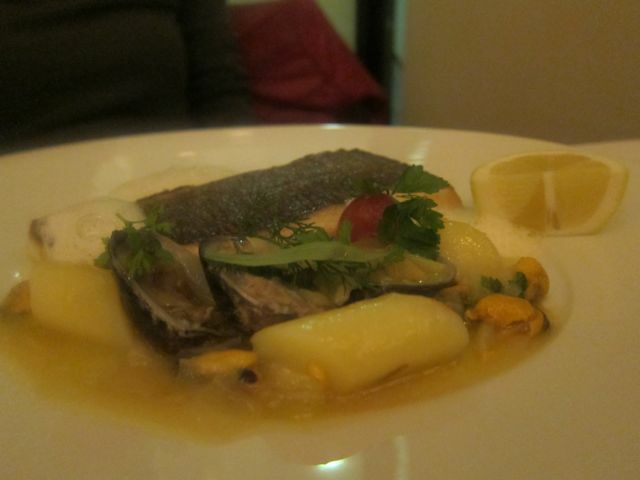 We decided to take the menu de saison which included a choice of entree, fish or meat and a dessert. Amuse Bouche 1: Parmesan gougères. 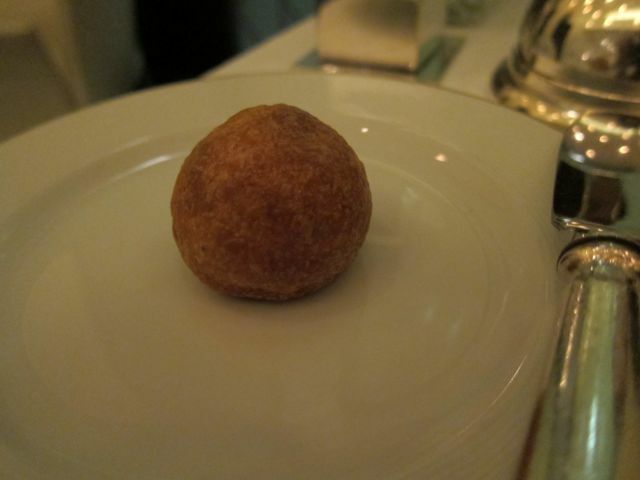 A pâte à choux with a strong parmesan flavor. 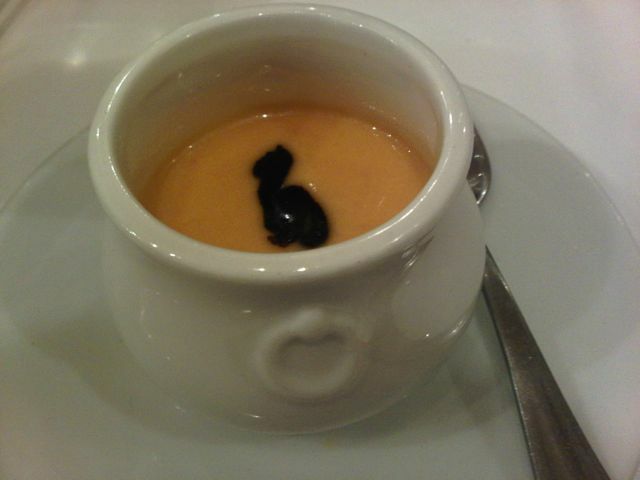 Amuse Bouche 2: Velouté de lait de chèvre, mousse au fruit de passion. 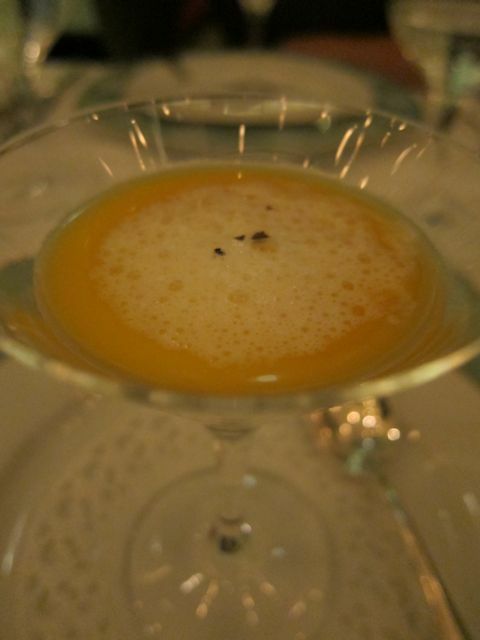 Mousse of passion fruit topped a broth of goat’s milk. It played well on the sweet/savory taste buds. 1. Terrine tiède de ris de veau, langoustine poelée, salade composée (warm terrine of veal sweetbread with langoustine and a side vinaigrette salad). 2. Tartare de thon, Parmesan “Reggiano”. 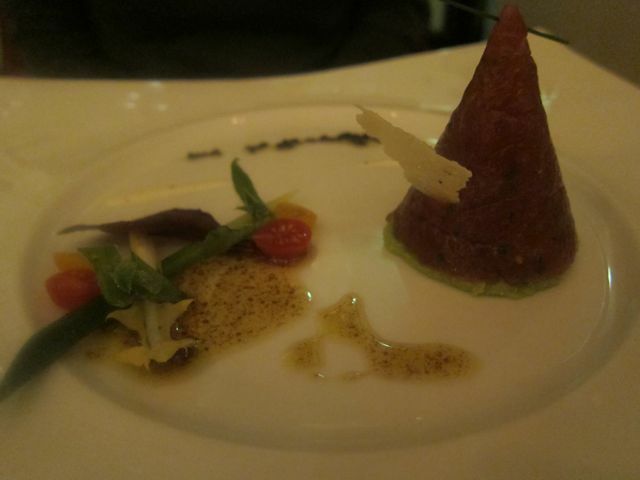 Tuna tartare with Parmesan cheese (I love the cone made out of tuna). 1. Daurade royale, marinière de coquillages. Roasted dorade with clams. Unfortunately, it was seasoned too much but it wasn’t overcooked and was light. 2. 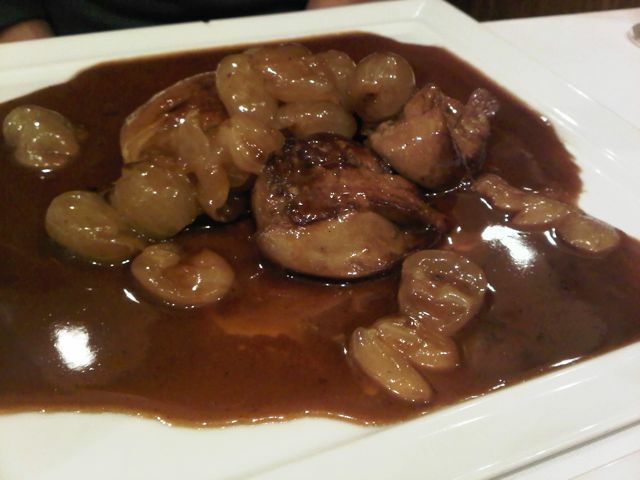 Supreme de Canette de Charente rotie aux figues, jus nature. Roasted duck with figs. The plate was hot but was dirty on the sides with the jus spreading throughout the dish very quickly and I know if Chef was in the kitchen, he would not be pleased! 1. Gratin de poivron rouge, tomate confit, sorbet basilic. 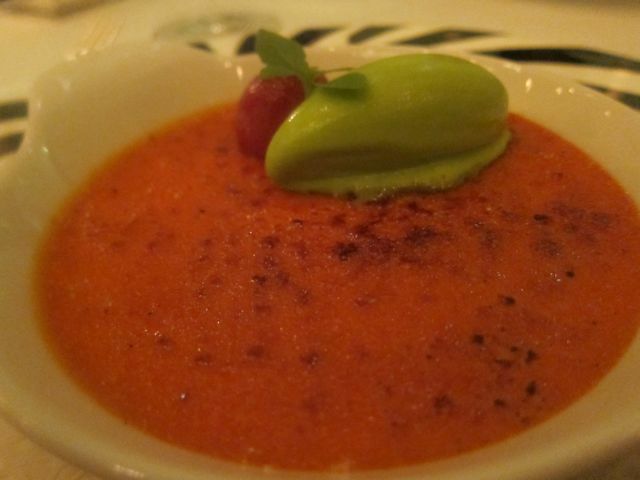 It was almost like a creme brulee of red pepper with a basil ice-cream. An interesting take on savory/sweet but not to my liking. 2. Montblanc ‘Maison’, glace vanilla et marrons. 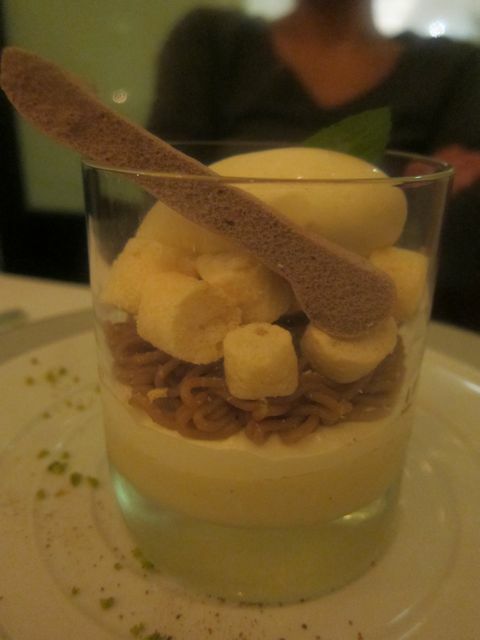 Sponge cake on pâte sucrée and in whipped cream wrapped with strands of chestnut vermicelli; it was crowned with a long meringue twig and teamed with vanilla ice cream. This was the best dish of the night. My overall impressing is mixed one. The dishes were thoughtful (except for the first amuse-bouche) and cooked flawlessly (apart from the dorade) and even experimental (dessert). At the same time, it was a ‘good’ but not ‘great’ meal, nothing leaped at me as amazing or mind-blowing and the atmosphere was very quiet, not vibrant, perhaps even restrained. But perhaps one short visit is not enough? 3. 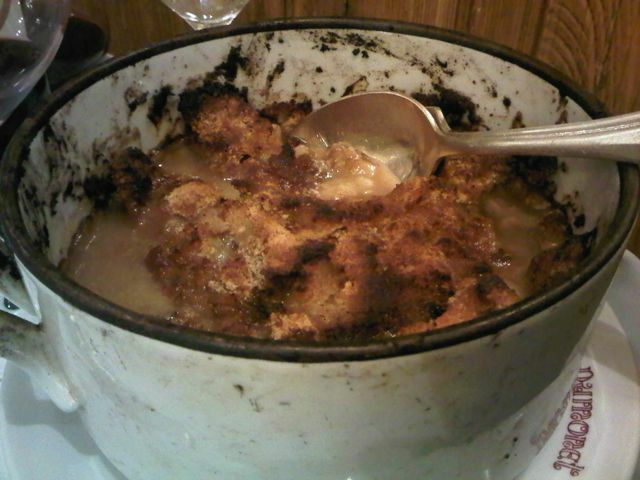 Cassoulet Maison (Saucisse, Confit de Canard, Poitrine de porc). Cassoulet came in a huge pot, simmered (for 1 day) with sausage, duck confit, pork belly and beans. This was the piece de resistance. A definite must-order at this restaurant. 4. 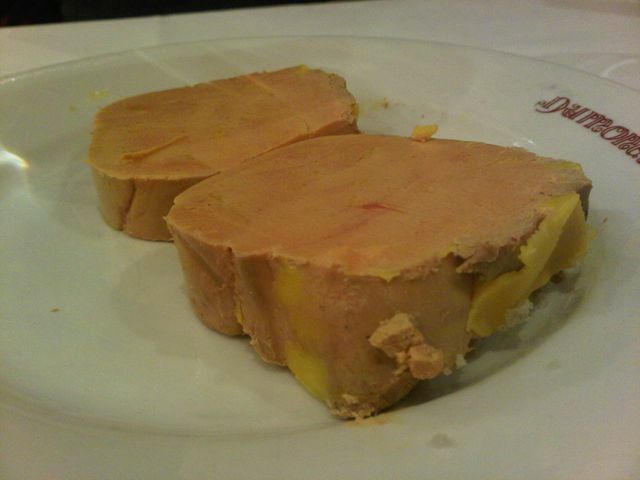 Foie de veau au vinaigre de framboise. Veal liver (not like we had enough already) with a reduction of raspberry vinegar. 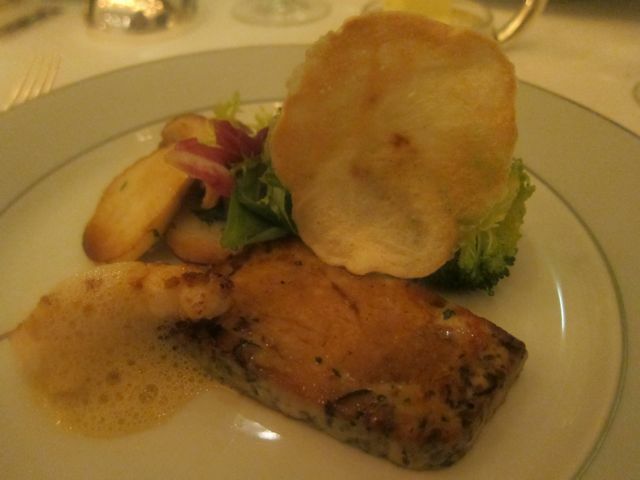 The food was A+ on my list; the portions were huge and the price very reasonable, alas the service was a bit restrained. We saw the souffle that came out of the kitchen and it was of course ENORMOUS but just had no more room in our stomachs. I’ll definitely come again and have drinks with Chef Dumonet! Since you say, one trip may not enough to fairly judge Stella Maris, will you going back then? 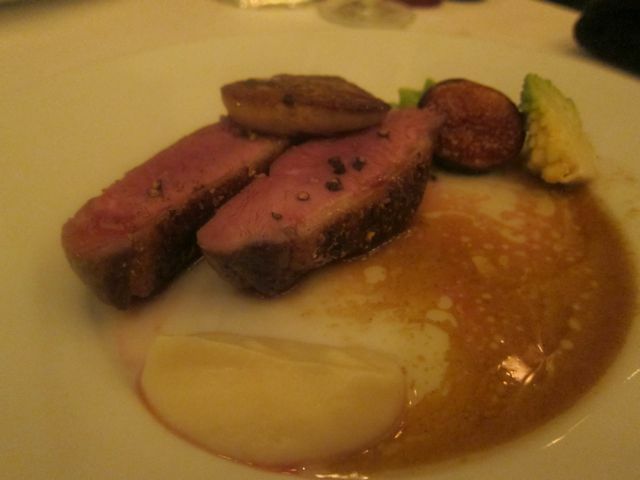 And, have you had better foie gras de canard (fresh) than Dumonet, if so please share! ?